marinate, covered, in fridge for 4 to 6 hours. 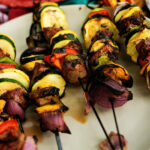 skewers, alternating lamb and veggie combos to fill each skewer. char and are tender, rotating as you cook.